Note to Editors: Four photos for this release will be available on the Canadian Press picture wire via Marketwired. 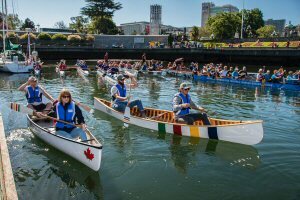 Today, iconic Canadian retailer Hudson's Bay kicked off its summer-long Grand Portage adventure in Victoria, British Columbia. The day marked the first leg of the 66-day journey and began with the three-person Grand Portage team meeting at Clover Point Park - Mile Zero of The Great Trail. 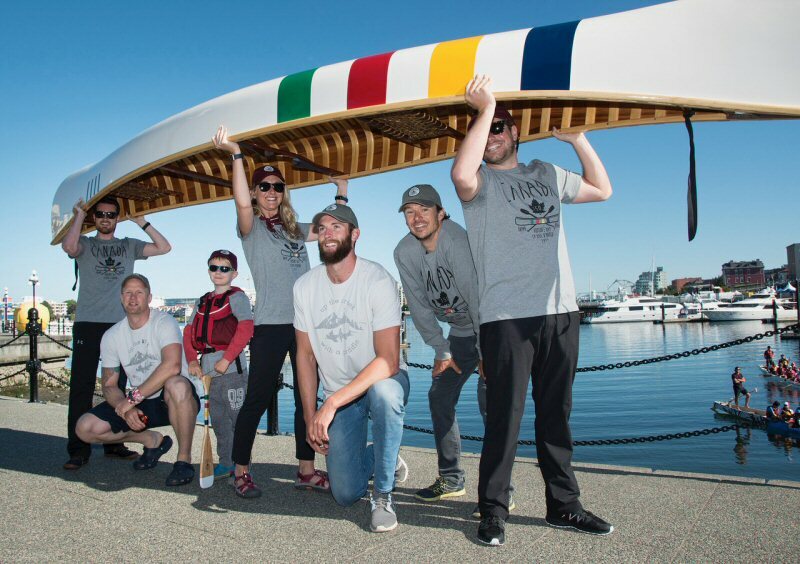 From there the team traveled to Victoria's Inner Harbour where they were joined by Outdoor Adventurer and two-time Olympic Medallist Simon Whitfield, Olympic Medallist Conlin McCabe and Adam Creek, Olympian and Trans Canada Trail Champion. Together the group enjoyed a morning of paddling with the Victoria-based Fairway Gorge Paddling Club. 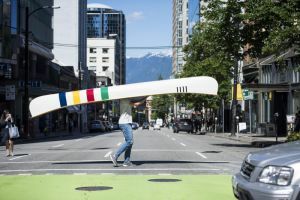 Later that day, the Grand Portage team made its way to Vancouver, British Columbia where they portaged through the downtown streets into CF Pacific Centre - the first of 10 Celebration Tour stops at Cadillac Fairview shopping centres across the country. 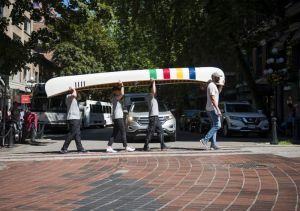 "This is the moment we've all been waiting for; to send our adventurers off in exploration of our vast, beautiful country, as they journey along The Great Trail," said Alison Coville, President, Hudson's Bay. "We are thrilled to bring the Grand Portage experience to all Canadians, to raise awareness and funds for the terrific cause of connecting The Great Trail." "We are so grateful to Hudson's Bay for partnering with us at Trans Canada Trail", said Valerie Pringle, co-Chair, Trans Canada Trail Foundation. "They are helping to raise awareness and significant funds to connect The Great Trail, which in turn helps us honour the thousands of volunteers and donors who have so generously given to this iconic Canadian project." During this summer-long adventure, Canadians across the country are invited to celebrate Canada's 150th with The Grand Portage Celebration Tour, taking place in partnership with Cadillac Fairview. The Celebration Tour will engage Canadians locally and give them an opportunity to support the connection of The Great Trail, in honour of Canada's landmark birthday. "Cadillac Fairview is thrilled to be the official host of the Grand Portage Celebration Tour," said Sal Iacono, Executive Vice President, Cadillac Fairview. "As a proudly Canadian company, we could not think of a better partner than Hudson's Bay, the country's oldest department store, to celebrate Canada's milestone birthday. We look forward to bringing this incredible experience to communities across the country at select CF shopping centres this summer." Travelling through eight markets and stopping at flagship Hudson's Bay locations between June and August 2017, the Grand Portage Celebration Tour will be anchored by pop-up retail mall activations at 10 premiere Cadillac Fairview shopping centres. 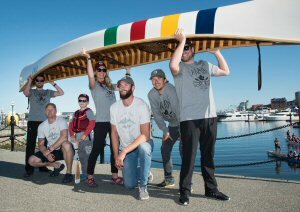 The immersive experience will include a Great Trail scavenger hunt, a social media booth featuring a Hudson's Bay iconic striped canoe, a fundraising wishing well and a screening lounge which will highlight sections of The Great Trail. At the center of these activations will be a rustic, wooden cabin, which will also serve as a pop-up retail space, selling the Grand Portage collection. Ranging in price from $4 - $119.99 CAD, a percentage of net proceeds from every purchase will support the connection of The Great Trail. In addition, Canadian and HBC Bursary athletes will make personal appearances at Hudson's Bay stores along the way, for customer meet-and-greets. Customers who pre-purchase the limited-edition, keepsake mini canoe paddle ($20) will have the opportunity to get their paddle signed by athletes in key cities across the country. On March 2, 2017, Hudson's Bay announced a commitment to raise $1 million to help connect The Great Trail, which is the longest recreational trail in the world. Both a fundraising initiative and a call to action to get outdoors and explore, the Grand Portage program includes a collection of commemorative fundraising merchandise, in addition to the Grand Portage team's journey across Canada. The Grand Portage team's adventure will culminate in a special celebration in Ottawa on August 26, 2017. 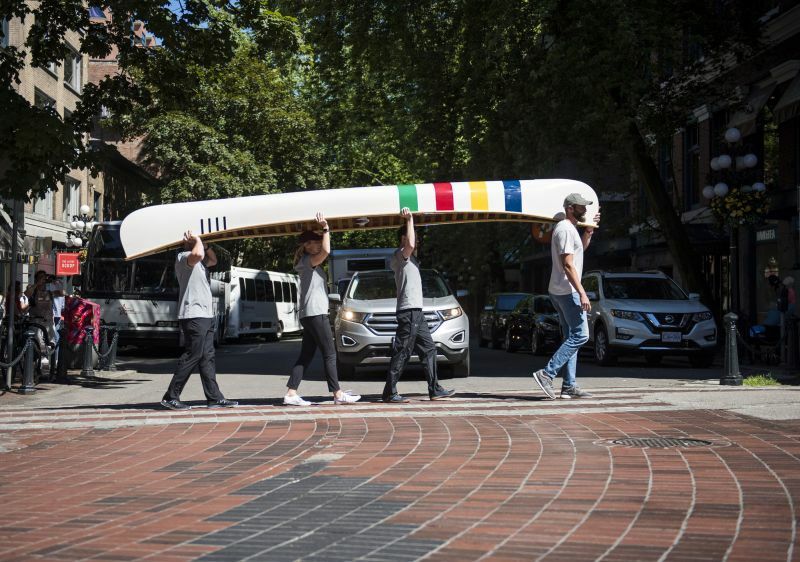 To follow along on the Grand Portage team's adventure, follow @hudsonsbay on Instagram, Twitter, Facebook and Snapchat and the official hashtag for the program #HBGrandPortage. For the full schedule and details about the Celebration Tour, or additional information on how to donate to The Great Trail, please visit hbgrandportage.ca. Cadillac Fairview is one of the largest owners, operators and developers of best-in-class office, retail and mixed-use properties in North America. The Cadillac Fairview portfolio is owned by the Ontario Teachers' Pension Plan, a diversified global investor which administers the pensions of more than 300,000 active and retired school teachers. The real estate portfolio also includes investments in retail, mixed-use and industrial real estate in Brazil, Colombia and Mexico. Valued at more than $28 billion, the Canadian portfolio includes over 38 million square feet of leasable space at 67 properties in Canada, including landmark developments, such as Toronto-Dominion Centre, CF Toronto Eaton Centre, CF Pacific Centre, CF Chinook Centre, Deloitte Tower and CF Carrefour Laval.